The venerable old grandfather of touch screen gaming, the Nintendo DS, isn't quite ready to roll over and go quietly just yet. In the past financial quarter Nintendo sold just over 2m consoles in the DS family, with 1.3m of those sales in the Americas. Financial year to date DS sales stand at 4.64m units around the world, with Nintendo revising its hardware target from 6m to 5.5m. Software-wise, 22.21m DS games were sold through October to December, with the Americas again contributing over 50% of that figure. Since April DS software sales stand at 51.2m, with Nintendo changing its target from 62m to 59m. Since the very first DS came out all those years ago, Nintendo has sold 151.06m consoles and 890.69m games. It'll be interesting to see what the final sales numbers are when the DS is discontinued. It's coming very close to outselling the PS2 (which currently stands at 153.19 million units), which would make it the best selling console ever. Keep on going, DS! I reckon DS can top it! 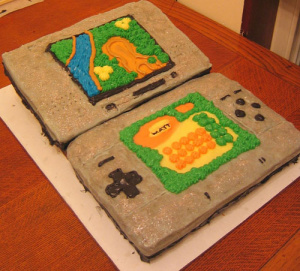 Is that a representation of Xevious on that cake? 2 million more and the DS will become the best selling handheld and system of all time! Keep going DS! I really hope the DS beats out the PS2 as the best selling game system of all time, it seems like everyone has a DS these days so it would be fitting. Come on DS! yeah, i'm with emaan 1 and @Square-enixFan - let's keep it going! We'll beat the PS2 in no time. @James, @Birdman13, it's obviously Animal Crossing! Have faith everyone. The ds WILL become the best selling console of all time. what do they mean with "meter"
Reminded me of 151 Pokemon.. I hope the DS outsells it too. Wow, then most DS owners own about 6 games. If they ever make a 3DS XL, they better make it with two slider pads as well. comon ds you can beat that record,comon!